Many thanks to everyone who came out for last week's Market at the Scare! It was chilly and damp, but we saw a lot of really excellent costumes. Next year's event will be a real bash, I think. For photos from last week, head over here. Chef Alisa has been writing excellent Market updates for Smile Politely - this week's column is no exception. There's a great photo of carrots - and YOU HAVE NOT LIVED until you've had carrots from the Market. look for them from several produce vendors, most of who are still hanging out at the Market. There is a preponderance of squash at the Market, too. Shapes, sizes, flavors abound... but what the heck does one do with these late fall jewels? Fear not - Culinate has some answers. OK. This week's Market is the next-to-last Market for the 2008 season. Market at the Square will open for the 2009 season (and begin partying like it's 1979, since it's turning 30 and all) on SATURDAY, MAY 2, 2009. I'll write a little more about what's in store for 2009... after November 8, 2008. Things went so well at last week's Sprouts event! A HUGE shoutout goes to Jen Hewitt and her stellar group of volunteers from the University's Student Dietetic Association - Sprouts doesn't happen without these folks. We gave away almost 70 tote bags, which means almost 70 kids "trick-or-treated" for fresh, seasonal produce at last week's Market and got a little education, to boot. Another huge shoutout goes to our participating produce vendors: Blue Moon Farm, Tiny Greens, Tomahnous Farm, Kleiss Produce Farm, Brackett Farm, Meyer Produce, Prairie Fruits Farm, and Moore Family Farm. Sprouts doesn't happen without these folks, either. This weekend is the last Saturday before Halloween, which means it's time to get those costumes out for a test run at Market at the Scare. I'll be taking photos of all the costumes and shenanigans, there'll be plenty of free candy and cider (good thing we had Sprouts last weekend...), and a couple lucky kids will be winners of pre-carved Market pumpkins. We'll start things off at 9 A.M., rain or shine - just look for the tent next to the City's Information Station. Both tents are located at the Market's NW entrance. "What happens after you guys are done outside?" After November 8, the City of Urbana is done with Market at the Square until Saturday, May 2, 2009 at 7 A.M. The Urbana Business Association picks up where the City leaves off and offers the community its Holiday Market, which is located indoors at Lincoln Square Village and runs from November 15 - December 20. It's not just an arts & crafts & gifts fair - many of the produce and food vendors you've come to know and love outside head inside when things finish up outside. The hours are a bit more civilized, too, especially with those dark winter mornings ahead - things start at 8 A.M. and run through 1 P.M. If you have questions about the Holiday Market, give Susan a call at the UBA at 344-3872. See you at the Market! I'll be the one in the witch hat. With candy. Trying not to eat it. ...the Market's slowly winding down it its typically bittersweet fashion. We've successfully consolidated operations into four rows and it seems to be going smoothly, but if you're ever looking for a vendor who doesn't seem to be in the right place, please come to the Market's Information Station at the northwest entrance - we'll be able to help. 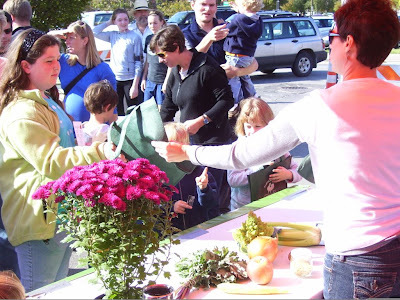 This weekend's Market features our final Sprouts at the Market event for the 2008 season. U of I's Jen Hewitt will lead another series of short nutrition workshops for kids, this time focusing on fall and winter fruits and vegetables. After the workshop, each participating Sprout will receive an official market tote bag and can "trick-or-treat" for something fresh and seasonal from participating growers. Workshops and trick-or-treating happen on the half hour starting at 9, with the last session underway at 10:30. Tote bags and produce supplies are limited, so please arrive early for your session to ensure participation! Questions? Email me or call 384-2319. Next weekend: Market at the Scare! Costumes! Picture-taking! Candy! Pumpkin raffling! Seriously, folks, it's a great way to take that Halloween costume on a dry run. One more thing: The Eastern Illinois Foodbank kicks off their 22nd annual Food for Families drive this weekend. Check their website for food donation locations and where to send cash donations - you can even donate online. It's crucial they meet their goals - over 136,000 people in Eastern Illinois aren't getting enough to eat, and the number is rising. 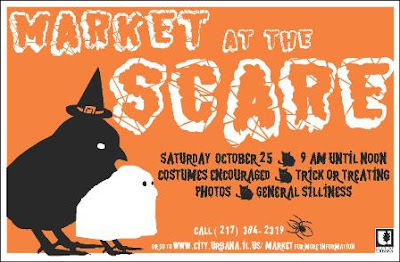 October 11: Market at the Square and Urbana's Public Arts Program are co-sponsoring a mask-making workshop headed up by local artist Lori Caterini. She'll be using recycled materials to help patrons of all ages create wearable works of art. The workshop begins at 8 AM and runs until the Market ends at noon. It's free and open to EVERYONE, and registration is not required. Please stop by the table - it'll be next to the City's Information Station at the northwest entrance to the Market. Please call Anna Hochhalter, Urbana's Public Arts Coordinator, at 384-2311, or Lisa at 384-2319 with questions. October 18: Sprouts at the Market, the Market's nutrition and farm-linkage program for kids, is back for some education and some healthy trick-or-treating. U of I dietetics student Jen Hewitt will provide a short nutrition workshop for the kids during 4 sessions (9, 9:30, 10, 10:30), who'll then take their official Market bag and trick-or-treat for produce at participating vendors' booths. Produce and bag supplies are limited, so please arrive early for a session to ensure participation. Registration is not required. The Sprouts tent will be located next to the City's Info Station at the northwest corner of the Market. Questions? Call Lisa at 384-2319. October 25: Market at the Scare! Patrons of all ages are encouraged to attend the Market in costume (your Market Director is already planning hers). There'll be candy, a local photographer documenting the whole thing for posterity, pre-carved pumpkin giveaways, and more! The hijinks get underway at 8 AM. More information is coming soon, but in the meantime, you can call Lisa at 384-2319 with questions. WILL-AM's Celeste Quinn, host of "The Afternoon Magazine", will be at the WILL tent this weekend along with other station folks - stop by and say hello if you get a chance. There might be a meteorologist hanging around, too - in that case, you can thank them for the beautiful weather they're promising us. The Eastern Illinois Foodbank is gearing up for their annual Food For Families drive, which happens this year from October 18 - November 1. They'll be at the Market this weekend - stop by their tent, donate some non-perishables, and find out what Food For Families and the Foodbank are all about. Row 5 has been retired for the season. The Market is seasonal and a lot of vendors end their season after the summer is over, so we consolidate operations to keep the Market vibrant and bustling. Many of the vendors you've come to know and love over the last few months that were in row 5 - Tiny Greens, the bagel folks, Ed the Bonsai Guy, etc - have been relocated to Row 4, so look for them there. If you're missing someone, please feel free to stop by the City's Info Station at the northwest entrance and ask - we can help you find them. a) Check out this area's best food blog, Champaign Taste, on Friday mornings for the week's recipe. b) Pick up the recipe Saturday morning at the Market at the Triple S farms booth (along Illinois Street). c) Download the recipes in PDF format any time from the City's Market page (the previous four recipes should be up by this Friday, and each Saturday's recipe will go up after the Market has closed). 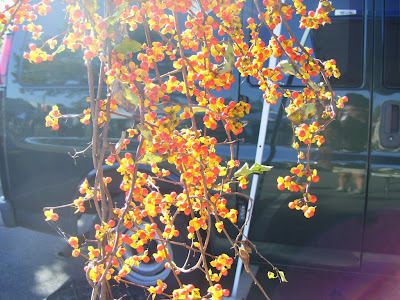 Speaking of Prairie Fruits Farm, they're blogging. Definitely worth a look! Whew. That's it for now. See y'all at the Market! Just confirmed that awesome batik artist Jill Miller - Hooeybatiks of Urbana - will be selling at the Market tomorrow. Kind of weird, because I just found my formerly-missing Hooeybatik shirt this morning after months of searching. Don't forget the Bike Rodeo this weekend - support bike safety for kids and stop by the Rodeo on your way in. If you have kids, consider riding in on your bikes! There's bike parking on Lincoln Square Village's south and east sides so you can park and shop. There will be corn this weekend. Not a lot, but corn nevertheless. I recommend coming early. Craft vendor Mary Finch, whose wares are found in Row Two, will be selling at the Market for the last time tomorrow - after thirty seasons in the business, she figures it's time to retire. She's been with the Market since it began in 1979 and could probably tell a story or two (or three, or four...). Stop by and wish her well! WILL's chef-in-residence, Doyle Moore, will be "in residence" at WILL's booth at the Market this weekend from 9-11. If there's something you've always wanted to ask him - now's your chance!